First you will need to download a Miranda-IM (latest version is available here). It is multi communicator. 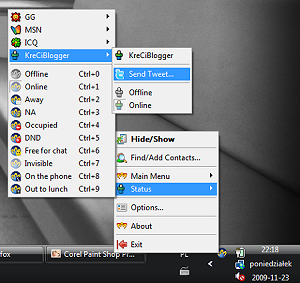 You may setup it for dozen of protocols you use like MSN, ICQ, IRC and many, many more... Miranda is very lightweight, so if you don't need anything more you can use it just for a twitter. It really won't take any noticeable part of your computer resources. It should be very easy. Just run a downloaded file and follow instructions. Please remember the path that you will choose for the installation as you will need it soon. You can download this plugin right from here. Please choose the latest version of first file on the list. Currently it is "twitter-0.0.8.4.zip". Now you should extract downloaded plugin. In you Windows system you can just double click on the file to see it's contents. 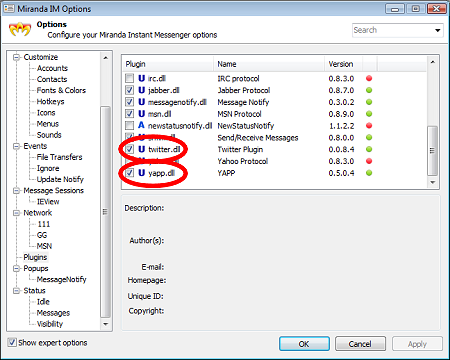 You should copy extracted "twitter.dll" file to "Plugins" subfolder in your Miranda-IM folder (path as set in step 2). Install it same way as twitter plugin. Download (from here), unzip and copy to plugins folder in your Miranda-IM installation. Make sure that "twitter.dll" and "yapp.dll" plugins are checked. 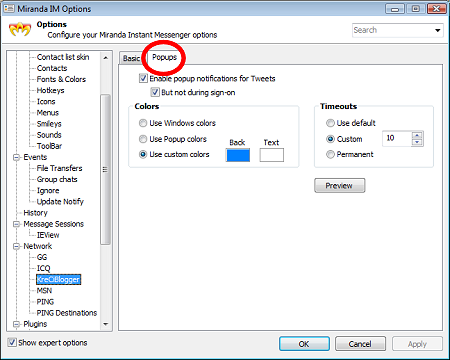 Enter your twitter account name, choose protocol (twitter) and again your account name. You are almost done! Click OK and again OK.
Make all settings in this tab as on the screenshot above. And click OK. Possibility to make tweets directly from your tray (as on screenshot below)! Do you have any problems, question or just some comments? Please leave a reply below. My next post will be about making a tweet from any Java enable mobile phone. So please come back soon... :) Don't forget to follow me on twitter for updates. Generally I do not post on blogs, but I would like to say that this article really forced me to do so! Thanks, really nice blog. I am also using twitter for professional purpose and the tool provided by you seems to be very useful. Lets see.